So after eight days and nine nights of hotel life I was missing my kitchen in ways that most people might find a bit overblown. Don’t get me wrong, I love eating out. I really do. I especially love eating out in other cities. The different flavors, textures, smells and all with no mess to clean up. But after a few days of eating 3 meals a day in restaurants or the hotel breakfast room a girl starts to dream of simple things like her own refrigerator filled with her normal healthy foods, or the possibility of eating a normal sized portion without feeling like she’s wasting her money if she doesn’t finish the whole plate -having her own refrigerator comes in handy for this too. 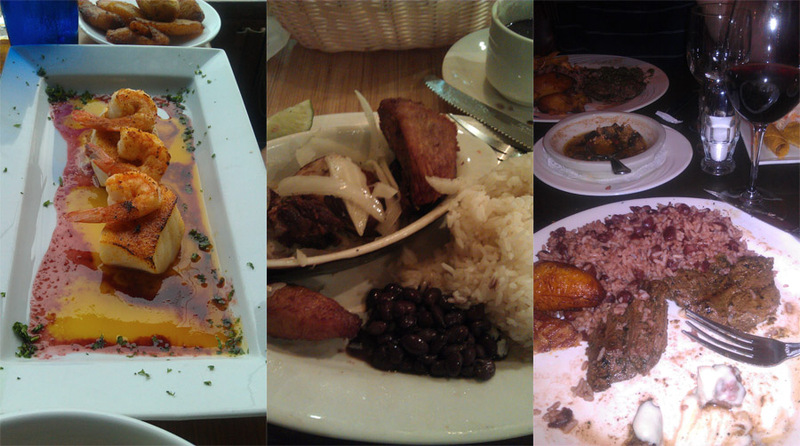 We ate some awesome food while in Miami. Authentic foods from other cultures and fresh seafood. Food that is a little harder to come by in Colorado. Food I am so glad I had the chance to eat and enjoy. With all those yummy food memories and a few extra pounds as souvenirs of our trip I’m just glad to be home where my kitchen, dinning room table and – apparently- my ability to eat smaller portions and not overindulge at every meal. In celebration of my return to the land of cooking I have a few recipes to share that are making my mouth water and getting me excited to get back into the groove in my own kitchen. 1. After all the fried food of the last week and a half Grilled Chicken and Berry Salad sounds so delightfully refreshing and perfect. 2. Two of my favorite flavors of summer are fresh tomato and basil. Leslie’s Caprese Pasta Salad looks like a just the dish to share with friends at a summer cookout. 3. We all know how much Luke loves chicken so I am always looking for new way to serve it up. Liza’s Lemon Balm Chicken speaks to my need for light, simple and fresh tasting food. 4. It may be hot outside but that doesn’t mean my desire to bake is diminished at all. Trina’s Strawberry Rhubarb Crisp may be just the thing to put my oven to work on. 5. What’s summer with out a summery drink? A cool glass of sangria sounds like a nice way to remind me of that delicious tapas restaurant in Miami without all the additional chorizo, manchego, croquette and stuffed pepper calories. The great thing about sangria is the customizable nature of the drink. Emily’s Sunday Sangria, with its summery fresh berries sounds like quite a treat. There’s a few of the mouth watering delights I’ve come across lately, what is making your mouth water today? I know what you mean….as much as I love eating out….sometimes just being home and making a grilled cheese sounds like pure heaven…thank you so much for featuring me! Isn’t it crazy that when we’re homing cooking a ton, we just want a restaurant and when we are forced to eat restaurant food, all we want is home cooking? I’m the SAME way! These foods look sooooo delicious! I’m going to have to try them ALL!